Use styles to structure your document: headings, lists, bold etc. Save document as plain text, in a format that preserves styles. Writage supports Microsoft Office 2010/2013/2016 on Windows. Writage is in active development now and available for free trial. 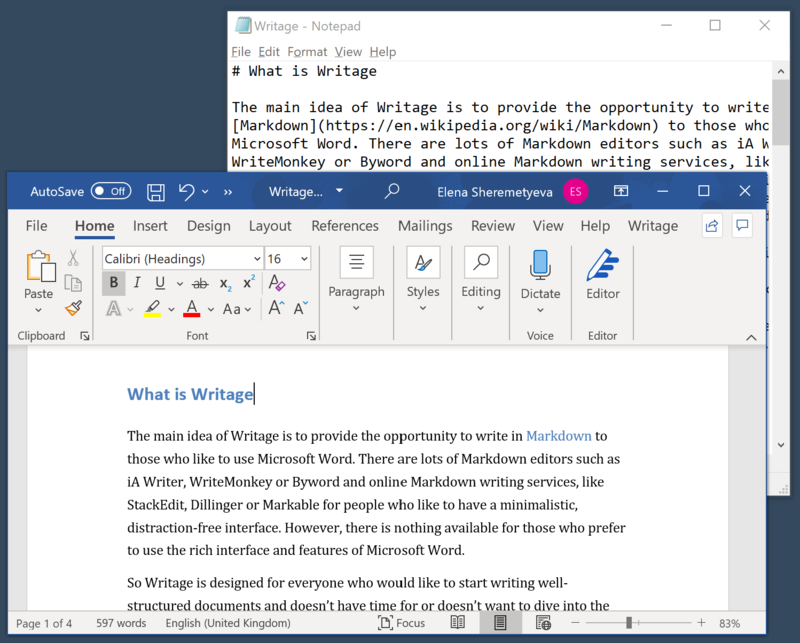 The main idea of Writage is providing opportunity to write in Markdown to those who like Microsoft Word. There are lots of Markdown editors such as iA Writer, Texts, WriteMonkey or Byword and online Markdown writing services, like StackEdit, Dillinger or Markable for people who like to have minimalistic, distraction-free interface. And there is nothing for those who prefer to use rich interface and features of Microsoft Word. So Writage is designed for everyone who likes to start writing well-structured documents and don't have time or don't want to drill into details Markdown syntax or prefer to use Word as a text editor. 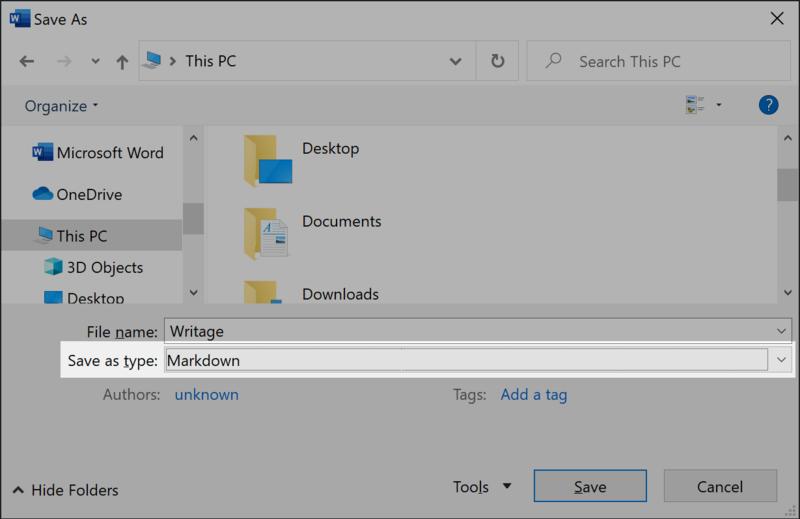 Writage enables Microsoft Word to create and edit Markdown files (with .md .markdown or .text extensions). You could also save your .doc file as Markdown file. The installation process is very simple and takes just a few minutes. Double-click on the file «Writage.msi» and follow the instructions. Please, note that you should have «Administrator» rights on your computer. After finishing installation your Writage plugin is ready to use. Uninstaller for Writage can be invoked via Control Panel. Writage turns Word into your Markdown WYSIWYG editor, so you will be able to open a Markdown file and edit it like you normally edit any document in Microsoft Word. Also it will be possible to save your Word document as a Markdown file without any other converters. On receiving Markdown document from other people or downloading from the web you don’t have to install any additional software to be able to read it as a normal document (without formatting tags which might be destructive for readers). Choose «Open» command and choose Markdown document you like. File will be shown like any other document. If you don’t like the idea of using Microsoft Word for writing you could simply save any Word document which you receive from you colleague as Markdown file and continue to work with your favorite Markdown tool. Launch Microsoft Word and create sample document. Choose «Save as…» command and choose «Markdown» from «Save as type» field. To be able to use rich formatting functions of Microsoft Word or simply to share your Markdown file with people who use Microsoft Word you should convert a Markdown file into a Word document. Choose «Save as…» command and choose «Word Document» from «Save as type» field. Writage also adds commands for copying selected text as Markdown, and for pasting Markdown as rich text. Zero knowledge of Markdown is required in order to write well-structured documents with Writage. No need to remember markup for hyperlink or footnote, or how to format a table. Microsoft Word interface is rich, offering document outline, spell checking, search and lots of other features important for writing. Please send emails to support@writage.com. Receive email when new version of Writage becomes available.